How many of us could provide First Aid seeing one of our colleagues lose consciousness at the office? How many of us know what to do in such a case, what to check, how to intervene and when to call for the ambulance? How do we recognize if it is a fainting incident or a cardiopulmonary arrest and how should we react in each case, in order to effectively help our colleague? Why is it important for someone to know First Aid? In the event of an accident or a sudden illness, every minute counts. If the waiting time of the ambulance is utilized for the provision of high quality First Aid, then the probability of saving a human life is increased. The standardized approach to an emergency case that requires First Aid is through rescue algorithms, to ensure the proper communication with the National Ambulance Service Center, the application of appropriate First Aid techniques and, above all, the safety of the First Aid provider, of the victim and of those present at the scene of the incident. Modern training that helps the personal development of the company’s employees. Imagine the feelings of someone who has done something as great as helping a fellow human whose life was in real danger. Can you realize how much motivation and how much power for his/her own personal development can therefore be provided to every worker through the knowledge of First Aid techniques? 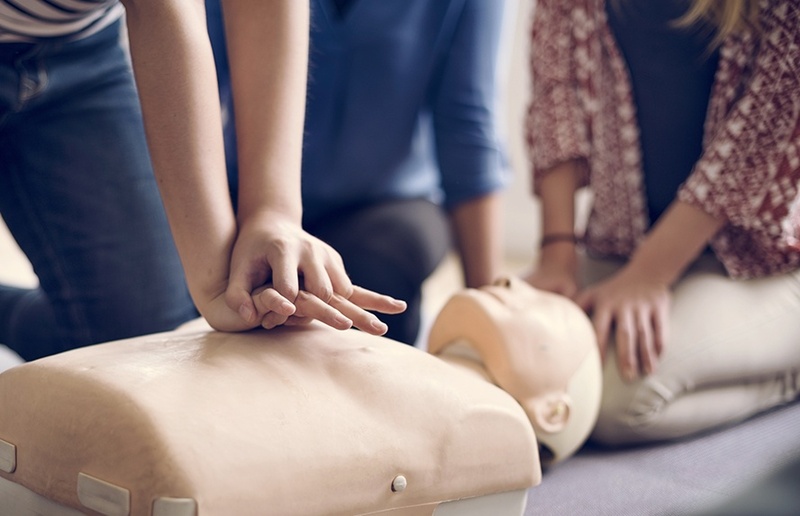 Indeed, attending the First Aid Seminars makes the participant feel safer in itself primarily and then it significantly boosts his self-confidence. This is the reason why the way the First Aid training has changed for employees the last few years, following the most modern global trends that require experiential learning with participatory methods and tools for the development of the personality of the trainee. In GEP, we were first to adopt the new global trends in First Aid Training, making the difference for you. First Aid is essential at workplace. Everyday people lose their lives in situations where if anyone could provide First Aid then the chances of saving a human life would have been improved. As unpleasant as it may sound, accidents and sudden illnesses occur often, especially at the workplace, and nobody wants to stand helpless until advanced help arrives. Even the basic knowledge of First Aid can make the difference for a person in need of care after an injury, e.g. bleeding, burn, fracture, but even in the context of managing more serious conditions, e.g. a heart attack or cardiac arrest. Why to choose the GEP Training? Our experienced trainers transfer knowledge and confidence to each participant, so he/she may, if necessary, provide effective First Aid. Our seminars, from the basics to the most advanced, are interactive and ensure that no trainee will leave without taking the knowledge and skills that will keep a person in life. Our instructors are certified by the European Resuscitation Council and are actively involved in the research and provision of emergency healthcare. Our Training Programs are based on the updated guidelines of the ERC (European Research Council) and provide specific and targeted guidance on how First Aid is implemented at the workplace, so it will be applied the right moment and shall deliver the best possible result. Methods on how the seminars are provided and to whom they address. GEP has developed First Aid programs that can be implemented either in a properly arranged room within the business facility or in our training center or additionally with the use of our e-learning courses, ie the distance learning method in a user-friendly and interactive environment. Our training courses aim at laypeople, but also at employees in all sectors, such as banks, insurance companies, shopping malls, sports facilities, industrial units, shopping centers, airports, educational units, hotels and restaurants, security guards and custodians, etc.